Mirror mirror on the wall why do I experience pain with no movement at all? It’s your mirror neurons. Mirror neurons? What on earth are those? You might not believe it and it’s certainly not the stuff of fairy tales but mirror neurons were apparently discovered in the brain, having an important role in social learning. Mirror neurons are understood to be specialized nerves that actually fire when you observe a movement performed by another individual. In the context of pain this could be important. The following post will discuss how mirror neurons might play a significant part in your pain experience. We’ve all grimaced or let out an ‘oooooo!’ when we see someone get badly injured. Blokes can be particularly animated doubling over and protecting our own groin when we see an image of a sports player getting one square in their crown jewels! So, what might make us do this? Mirror neurons have been linked to empathy meaning that we literally experience someone else’s pain through our own empathetic response. More on this later. Ok so I may have told a little white lie. Whether mirror neurons exclusively exist in the human brain is still under some scrutiny because of the complexities involved in detecting them . Neuroimaging is apparently not that sophisticated (reference). There have been several studies done on mirror neurons since they were first discovered in the 1990s yet performing the types of invasive procedures is most likely a difficult one to get approval from an ethic committee! A fascinating piece of bio-engineering mirror neurons have only been discovered in the last 20 years!! They were first stumbled on during experiments on Primates by Giacomo Rizzolatti et al (1996), a medical doctor from Parma, Italy. Dr Rizzolatti and his team were investigating parts of the brain, the prefrontal cortex and parietal cortex in Macaque monkeys, identifying neuron activity when the Monkey performed a movement (reaching and grasping food). This was not the amazing discovery; motor action had been known for quite some time. Astonishingly, Rizzolatti identified that a subset of the same neurons would fire when the monkey saw another primate (human) perform the same action that the monkey had performed previously. It literally was a case of monkey see monkey do! Interestingly, it has been proposed that humans have the same mirror neuron system and it appears that they are not exclusive to sensory-motor areas of the brain, there are mirror neurons all over the brain (reference). Why is this significant? Well it could explain why humans have evolved so rapidly as sentient beings in that by seeing another person performing an action we learn very quickly how to perform the action i.e. a toddler learning and copying their parents performing a task. Rizzolatti termed this as action understanding. The famous psychologist Albert Bandura made several contributions to social cognitive therapy or social learning, demonstrating how people learn from observing others. In 1961, his bobo doll experiment demonstrated how children would imitate their parents through observation. Whilst mirror neurons were not discovered till the 1990s, there does now appear to be a neurobiological link between mirror neurons and Bandura’s Social Cognitive Therapy (reference). Further studies of motor mirror neurons include humans observing monkeys, dogs and other humans performing actions that were recognized by the observer such as eating or grasping. However these neurons did not fire when an unfamiliar action was performed such as barking (reference). This is what is understood as intention understanding or mind reading ‘Theory of Mind’. As we can assume that if an individual grasps an item of food they intend to eat it. This stuff is really important in terms of pain as we recognize actions that might fire a neurotag for a particular movement i.e. we identify that an individual is walking, jumping or lifting which dependent on the context may in turn be associated with a neurotag of a painful experience. One study (not using fMRI) in particular was done on epilepsy patients whilst they were having brain surgery. Several areas of the brain were being monitored for activity under 3 different conditions: performing a hand or facial movement, observing a 3 second video of a hand or facial movement, or reading a cue to move their hand or face but not executing the movement. They found that between 6% and 14% of the brain areas were recorded as mirror neurons; that being mirror neurons were active during both performance and observation of a particular hand or facial movement (reference). This identifies an action understanding and imitation hypothesis, which was first hypothesised when mirror neurons were first discovered. Mirror neurons have also been linked with empathy and language. Currently this appears to be the only study that has performed such invasive procedures to identify if mirror neurons do exist in the human brain and this is where the issue lies for an actual single-celled neuron to have mirror capabilities is somewhat premature. As stated at the beginning of this post I’m sure we have all let out a cry of empathy when we see someone else get injured. Humans are very social with the intention of our brain to enable us to interact with other humans in order to understand their feelings and behavior (reference). Several studies have been done into individuals experiencing pain or unpleasant sensations whilst observing others receiving the unpleasant experience (reference, reference, reference, reference). The studies highlight that by merely observing pain in another we to can experience pain and discomfort without even sustaining damage or the unpleasant sensation. Interestingly individuals in a relationship observing their partners receiving a painful stimulus were more likely to experience higher levels of pain compared to those observers that had no relationship to the subject. Now this all sounds pretty astonishing yet there is still a lot of conjecture around mirror neurons for the following reasons. A recent review highlighted that although the assumption that mirror neurons underlie empathy there is not the empirical support to back these claims. The reason for this is that brain areas are usually mapped and not single cell areas due to the form of imaging or mapping that is used in the research. The imaging would have to be a lot more invasive (probes stuck deep down into the brain). So to claim that we have actual empathy mirror neurons is difficult. There are areas of the brain that light up to suggest that an observer watching another individual experiencing pain might be related to empathy mirror neurons but to say they exclusively exist is a difficult claim to make (reference). 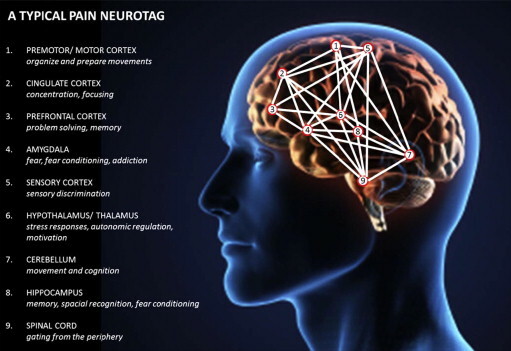 If we consider the pain neuromatrix and the Pain neurotag model, mirror neurons in this context could be of significant importance. Neurons in our brain are communicating constantly, firing off many different neurotags. If what we see is based around intention understanding then it could be hypothesized that this could be a contributing factor towards a pain experience evoking a pain neurotag. Neurons in the somatosensory cortex fire when we ourselves experience sensations (heat, touch, pressure, movement) that may (given that they are associated with a pain neurotag) give rise to pain. Yet in the cingulate cortex (emotion formation and processing, learning and memory) and insular cortex (consciousness and emotion) mirror neurons will fire concurrently when we see another individual experience pain creating an empathetic response and thus the observer experiencing pain. This is a compelling idea but due to the numerous and complex processing aspects associated with these brain areas it is again difficult to assume that this is exclusively down to mirror neurons. Research continues into mirror neurons as they are said to bridge the gap between science and the humanities, which in terms of evolutionary perspectives explains why humans became a successful dominant species in the world today. In order to understand more about mirror neurons researchers need to literally delve deeper into the brain and be able to isolate specific nerve cells to determine if they have mirror capabilities. Until neuroimaging becomes more sophisticated Mirror Neurons may just be a thing of fairy tales. It appears that a meta-analysis demonstrated from over 130 studies that mirror neurons are not a thing of fairytales after all (reference).